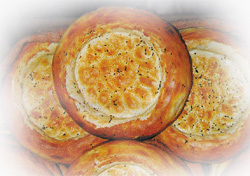 Uzbek National Cuisine - Breads and Pastas! 1 kg or 7 1/2 cups flour, 30 g (1 oz) yeast, 1-2 cups milk, 3 tablespoons oil, salt. Dilute yeast in warm milk. mix in little sifted flour and oil. Add the rest of the flour and salted water as necessary. Knead dough and let stnad covered in warm place. Divide dough into 150-200g (5-7 oz) pieces and roll into balls. Flatten into round bread, 2 cm (3/4 in) at edges and 1 cm (2/5 in) in the center. Make a pattern in the center with a chekish. Sprinkle water on the underside and bake in a tandoor or an oven. Prepare dough as in flat bread recipe above. Divide dough into 150-200 g (5-7 oz.) pieces and roll into balls. Flatten into round bread, 2-3 cm (3/4-1 in) at adges and 5 mm (3/16 in.) in the center. Make a pattern in the center with a chekish. Sprinkle water on the underside and bake in a tandoor. 1 kg or 7 1/2 cups flour, 2 cups water, 2 teaspoons salt, 40 g (1 1/2 oz.) yeast, 1 cup cubed animal fat. Fry fat, drain, and cool. Prepare dough as in flat bread recipe above owrking in pieces of fat evenly throughout the dough. Divide dough into 40 g (1 1/2 oz) pieces and roll into balls. Continue with Obi-non recipe from above. 1 kg or 7 1/2 cups flour, 2 cups water, 2 teaspoons salt, 30 g (1 oz) yeast, 10 g (1/2 oz.) sesame and poppy seeds. Recipe is identical to Obi-non above, except make the dough a little less stiff and allow to rise an extra 25-30 minuntes. Stamp patterns on top, scatter with sesame and poppy seeds, and bake in a tandoor oven. 1 kg or 7 1/2 cups flour, 30 g salt, 30 g (1 oz.) yeast, 60 g (2 oz.) dry milk, 40 g (1-2 oz) beef fat, 180 g onions, 14 g or 1 tablespoon vegetable oil, 20 g sesame seeds, 730 ml or 3 cups water. Recipe is the same as Obi-non above. Stamp patterns on top and sprinkle with thinly sliced onions and sesame seeds. Allow to rise another 15-20 minutes under a pastry cloth and bake in a tandoor oven. 1 kg or 7 1/2 cups flour, 1L or 4 cups water, 1 cup chickpeas, 1 teaspoon anise seed, 2 teaspoons salt, 30 g (1 oz.) yeast. Basic dough recipe is the same as Obi-non above. Pick and clean the best dried chickpeas and crush. Boil anise seed in water and then add crushed chickpeas. Cool for about an hour, add yeast and mix well. Add anise water to flour and make dough. Divid into pieces, flatten into round bread, 2.5 cm (1 in) at edges and 1 cm (2/5 in) in the center. Make a pattern in the center with chekish and make decorative pattern on sides bread with a knife. Bake in tandoor oven. Make dough with warm salted water, yeast, grease, and stifted flour and let stand for 10-15 minutes. Divide dough into 200 g (7 oz) pieces and roll into balls. Flatten into round bread about 3-4 mm (1/6 in) thick. Make indentations on the top with chekish to reduce thickness of the edges and bake in a tandoor. 1.5 kg or 11 1/4 cups flour, 200 g (7 oz) margarine, 700 g or 3 cups milk, 13 g or 1 teaspoon oil, 20 g salt. Dissolve salt in milk, add softened margarine and stifted flour and let stand for 30-40 minutes. Roll out dough into balls and let stand another 20-25 minutes. Flatten into round bread about 3-5 mm (1/8-3/16 in) thick. Make deep indentations on the top with a checkish to reduce thickness of the edges and bake in a tandoor. 1 kg or 7 1/2 cups flour, 2 cups water, 1 1/2 cups grease or kaimak, 2 tablespoons sugar or confectioner's sugar, 2 teaspoons salt, 1 cup butter. Add sifted flour to warm salted water. Knead dough and let stand 10-15 minutes. Roll out into a thin layer, 1 mm (1/25 in). Rub surface with grease, sour cream, or butter. Roll the dough around itself using a rolling stick (similar to a dowel). Cut lengthwise along the stick which 2 cm (3/4 in) strips. Roll up each strip, place in its side and flatten with a rolling pin to a thickness of 1 cm (2/5 in). Coat frying pan with melted butter and fry on both sides. 1 kg or 7 1/2 cups flour, 2 cups water, 1 cup kaimak, 3 onions, 1 cup butter, salt. Add sifted flour to warm salted water. Knead dough and let stand 10-15 minutes. Roll out into a thin layer, 1 mm (1/25 in) and coat with kaimak. Sprinkle surface evenly wih chopped onions. Roll the dough with onions around itself using a rolling stick. Follow recipe for katlama above. Coat frying pan with melted butter and fry on both sides. 1 kg or 7 1/2 cups flour, 2 cups water, 3 cups milk, 2 tablespoons sugar, 300 g (11 oz) butter, salt. Make sauce by adding one cup flour to sweetened milk and cook until it thickens. To make dough, add water and salt to sifted flour. Allow to stand in warm place. Cut dough into 50 g (1-2 oz) pieces, roll out like flat bread and fry in butter. Coat top surface with milk sauce and fold into a half-moon. 1 kg or 7 1/2 cups flour, 300 g (11 oz) mutton or beef, 2 onions, 1 tablespoon butter, salt, pepper, 250 g (9 oz) vegetable oil for frying. Mince the meat in meat-grinder and fry in oil. Make stiff dough out of flour, salt, and water, roll into tortilla-shaped breads but even thinner. Rub frying pan with butter and fry dough on both sides. Remove and fry second bread on one side. Flip over, spread out a thin layer of minced meat on the the side that has been fried. Layer with first bread and spread out another layer of filling and top with uncooked dough. Turn the entire stack over, repeat with filling and layers of dough. Make stack about 10-12 high. Cook on very low heat. To serve fold each layer with meat filling like an envelope. 1 kg or 7 1/2 cups flour, 1 1/2 cups water, 4 teaspoons salt, 50 g or 1/4 cup greese, 800 g (28 oz) meat, 500 g (18 oz) onions, 200 g (7 oz) animal fat, salt, spices to taste. For the filling, put meat through a meat-grinder, combine well with choped onions and fat, salt and spices. To make stiff dough, add water and salt to sifted flour, let stand for 30-40 minutes. Roll out dough into thin layer, use mouth of a glass to cut out circles. Place a spoonful of filling in the center, pinch edges up around the filling forming a ball and completely enclosing the meat. Sprinkle the sides with water and join samsa together in a square. Coat top with beaten egg and bake 30-40 minutes in tandoor or oven. 600 g or 4 1/2 cups flour, 4 eggs, 200 g or 4/5 cups water, 700 g (25 oz) meat, 800 g (28 oz) onions, 160 g (5-6 oz) mutton fat, salt, pepper and cumin to taste. For the filling, combine finely diced (or minced) meat with chopped onions and fat, salt and spices. To make dough, add water, salt and egg to sifted flour, let stand for 30-40 minutes. Cut dough into 20 g (7/10 oz) pieces and roll out each piece into small flat rounds. Place a spoonful of filling (40 g or 1 1/2 oz) in the center, pinch edges up around the filling forming a ball and completely eclosing the meat. 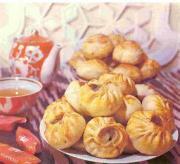 Join the sides of two samsa together and caot with beaten egg. Place on a greased pan and bake 25-30 minutes. 1 kg or 7 1/2 cups flour, 1 kg (2 1/4 lb) meat, 1 kg (2 1/4 lb) onions, 110 g (4 oz) mutton fat, salt and pepper to taste. For the filling, put meat through a meat-grinder, combine well with chopped onions, cubed fat, salt and pepper. To make stiff dough, add water and salt to sifted flour, let stand for 30-40 minutes. Cut dough into 70 g (2 1/2 oz) pieces and roll out each piece into small flat rounds. Place a spoonful of filling in the center, pinch edges up around the filling, form an oval, and completely enclose the meat. Stick samsa to the walls of a tandoor and bake 25-30 minutes. 1 kg or 7 1/2 cups flour, 800 g (28 oz) meat, 500 g (18 oz) onions, 150 g (5 oz) mutton fat, 50 g (2 oz) butter, cumin, salt and pepper to taste. For the filling, put meat through a meat- grinder, combine well with chopped onions, cubed fat, salt and spices. To make dough, add warm water and salt to sifted flour, let stand for 30-40 minutes. Roll out dough into 3-4 mm (1/8 in) layer and greese surface with melted butter. Roll up the dough tightly forming a log, and cool. Cut log into 70 g (2 1/5 oz) pieces and place on their flat sides. Roll out into small flat rounds. Place a spoonful of filling in the center, pinch edges around the filling forming oval pastry, and completely enclose the meat. Stick samsa to walls of tandoor, sprinkle water on top, and bake 20-30 minutes. 650 g or 4 3/4 cups flour, 400 g (14-15 oz) pumpkin, 2 egg, 160 g (3-4 oz) onions, 150 g (5 oz) mutton fat, 70 g (2 1/2 oz) margarine, sugar, salt and pepper to taste. For the filling, combine diced pumpkin with chopped onions, fat, salt, sugar and spices. To make dough, add warm water, egg and salt to sifted flour, let stand for 30-40 minutes. Roll out dough into 3-4 mm (1/8 in) layer and grease surface with melted margarine. Roll up the dough tightly forming a log, and cool 5-6 hours. Cut log into 50 g (2 oz) pices and place on their flat sides. Roll out into small flat rounds. Place a spoonful of filling in the center, pinch edges around the pumpkin forming a square pastry, and completely enclose the filling. Bake 20-25 minutes in an oven. 1 kg or 7 1/2 cups flour, 2 cups water, 2 eggs, 60 g or 1/4 cup vegetable oil, 2 kg (4 1/2 lb) mixed greens (clover, mint, coriander, etc. ), 100 g (3 oz) mutton fat, 2 bundles (6 oz) green onions, 4 onions, cumin, salt and pepper to taste. For the filling, combine finely chopped greens with chopped onions, cubed fat, salt and spices. To make dough, add water and salt to sifted flour, let stand for 30-40 minutes. Cut dough into 50 g (1-2 oz) pieces and roll out each piece into small flat rounds. Place a spoonful of filling in the center, pinch edges closed around the filling, and form a ball. Bake 30-40 minutes. 600 g or 4 1/2 cups flour, 500 g (18 oz) potatoes, 120 g (4-5 oz) onions, 120 g (4-5 oz) margarine, 100 g or 7 tablespoons vegetable oil, salt to taste. For the filling, combine diced boiled potatoes with sauteed onions, salt and spices. To make dough, add warm water and salt to sifted flour, let stand for 30-40 minutes. Roll out dough into 1.5-3 mm (1/16-1/8 in) layer and grease surface with melted margarine. Roll the dough around itself using a rolling stick. Cut lengthwise along the stick which will result in several layers of strips of dough. Cut strips into appoximately 6x8 cm (2x3 in) squares. Place potato filling in the center of each square, fold in half, and pinch edges closed with your fingers. Deep-fat fry in hot oil. 1 kg or 7 1/2 cups flour, 1 1/2 cups water, 2 eggs, 700 g (25 oz) meat, 50 g (2 oz) onion, salt and spices to taste. Combine minced meat with chopped onions. To make dough, combine water, salt and sifted flour, let stand for 2-2 1/2 hours. Divide into 20-30 g (1 oz) pieces. Flatten and place minced meat in center. Fold into half moon, pinch the edges together lightly and deep-fat fry. 1 kg or 7 1/2 cups flour, 1 1/2 cup water, 1/2 cup oil, 30 g (1 oz) yeast, 1 kg (2 1/4 lb meat, 500 g (18 oz) onions, salt and spices to taste. For the filling, combine finely diced (or minced) meat with chopped onions, salt and pepper. To make dough, combine water, oil, salt, sifted flour and yeast, let stand for 2-2 1/2 hours. Divide into 40-50 g (1/2-2 oz) balls. Roll out to a thickness of 3 mm (1/7 in) and place minced meat in the center. Fold dough up aroun filling, leaving a circular opening at the top. Place on greased pan, open side up, and let rise another 5-10 minutes. Coat with beaten egg and bake in pre-heated oven (200-240 C) for 8-10 minutes.